We're back from storytime break and I finally got to do another Preschool Lab! This week, we talked about building and construction, exploring the concept in a brief storytime (20 minutes) and then opening up for playtime with lots of different building materials. Book: Tip Tip, Dig Dig by Emma Garcia. This is a great book for audience participation. I had the kids dig, roll, lift, and push along with me as we read the text. Song: Dump Truck. I found this song on Katie Salo's Storytime Katie blog. The kids loved it! Bumpety-bumpety goes the dump truck! We sang it through once and then I asked what we should put in our dump truck. The kids suggested wood, sand, and concrete as we sang the song again several times. Book: Construction Zone by Cheryl Willis Hudson and Richard Sobol. I wanted to use a book with actual pictures and this is a great one. The text is a little long for my preschool audience, so I paraphrased or just described what was happening in the pictures. As much as I could, I tried to relate the building in the book to our library building, pointing out our two floors, the fixtures in our story room, etc. Both of the books we read today have lots of great vocabulary words! Rhyme: Five Little Nails. I got this rhyme and prop idea from Melissa Depper at Mel's Desk, but we actually didn't use it today. I had it in my plan, but the kids were a little squirrelly after that longer book, so I decided to skip the rhyme and go right into our felt activity, which would give them a chance to get up from their seat. Felt Board Activity: Color Machines. I passed out the machines and had each child bring their machine up to our "Construction Zone" as I called for it. (Our set of color machines includes one in each color that does not have a felt backing and has a label with the machine name on it, which makes it easier! This is a great activity for reinforcing some of the vocabulary words we'd heard in our books. Also, using activities where children approach the storyteller helps them get used to approaching adults outside their family (including, one day, their schoolteacher!). Stations: Today we were all about building, which was lots of fun and pretty easy to put together (win-win). I had stations where the kids could build with Duplos, build with recycled materials, and play on the felt board with our color machines. The kids had a BLAST building with all our recycled materials. 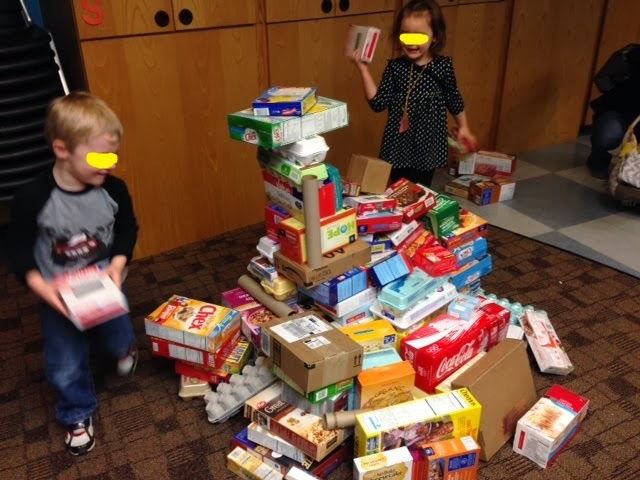 For about 2 weeks before the program, I collected any clean boxes and egg cartons that our library staff was willing to bring in for me. We had cereal boxes, cake mix, crackers, paper clips, etc. I had volunteers tape up the open ends to give the boxes a little more structural integrity. ETA (3/3/14): The science comes in here as kids experiment with building with different materials. What happened when the piece they had didn't fit where they thought it would? How could they use different shapes? What happened when their buildings became top-heavy? How could they balance different "blocks" to create taller towers? How could they provide more support to create bridges and other structures? I saw kids experimenting and answering these questions for themselves as they played. As the kids built, I talked to them about what they were building, what pieces they needed, who lived in their castles, etc. We're planning to do a weekly storytime and building night this summer and we'll definitely be saving our recyclables again for this activity. I encouraged everyone to take a craft packet home. I had a handout with several extension ideas and a book list. In their packet, I included a half-sheet of construction paper and a bunch of shapes cut out from our paper scraps. The instructions encouraged children to build a "shape town" out of the shapes.